A total of 16 teams entered for some fast and sometimes furious and, as ever, competitive hockey whilst enjoying the pitch side BBQ and bar. Umpires were provided by several Hawks regulars including Family Sunderland, H, Chair and the Madden Whites. 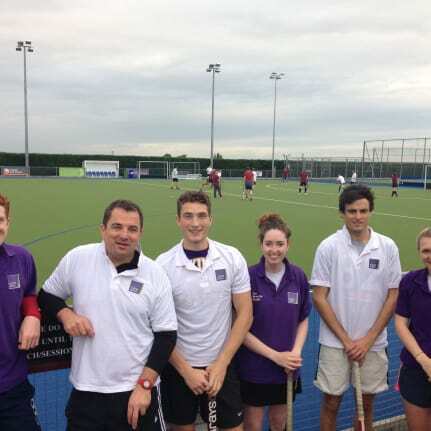 The semi-finals saw Patent Attorneys’ Dehns’ beat Lloyds Bank. In the other semi-final the match between Carter Jonas and Shaw Gibbs ended in a 1-1 draw, leading to extra time and eventually penalty pushes from the half way line to an open goal. Shortly before dawn Carter Jonas found the goal to reach the final. The final match itself was evenly matched with some good hockey skills on show but Carter Jonas edged it to win the coveted (but somewhat small) trophy as ‘victor ludorum’: a bit of a turnaround having come last in 2015. Hawks scouts were out in force that night looking to welcoming some new faces to the club in the new season…. Hopefully next year the tournament can grow further and other businesses with links to Hawks can be encouraged to join in. Thanks again to Hawks Hockey for hosting. The money raised on the evening will go towards our Charity of the Year, SeeSaw.